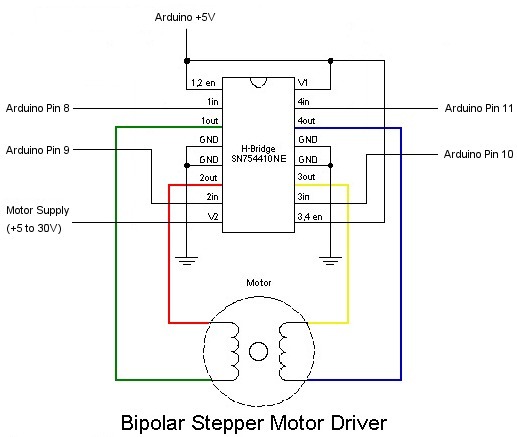 In this tutorial we will show you how to connect a bipolar stepper motor to an Arduino Uno board. The stepper motor we are using is the Sparkfun Stepper Motor but you can use any other 4-wire bipolar stepper motor. Because a stepper motor draws a higher current than the Arduino processor can handle we are going to use a Quad half H-Bridge chip to control the stepper motor. The popular Texas Instruments SN754410 chip is ideal for this. The Arduino Stepper library will work directly with this chip without any code modifications, so it is just a simple matter of wiring it up as per the diagram below. Once all wired up, load one of the example stepper motor sketches. The One-Revolution sketch is shown below which turns the stepper motor one revolution in one direction, then one revolution in the other direction. This program drives a unipolar or bipolar stepper motor. The motor is attached to digital pins 8 - 11 of the Arduino. one revolution in the other direction.